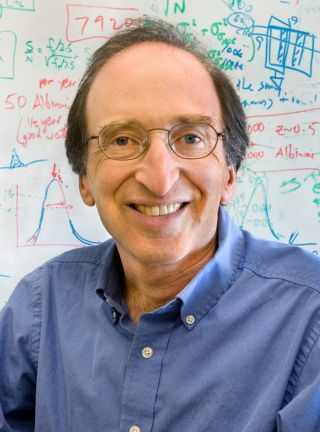 Saul Perlmutter won the 2011 Nobel Prize in physics for his work revealing the accelerating expansion of the universe. Dark energy is still mystifying, even to those that first discovered it. Saul Perlmutter, an astrophysicist at Lawrence Berkeley National Laboratory in California, won the 2011 Nobel Prize in physics for helping reveal that the expansion of the universe was accelerating (he shared the prize with Brian Schmidt of the Australian National University and Adam Riess of the Space Telescope Science Institute). Whatever is causing this acceleration has been dubbed dark energy, a name that speaks plainly of its continuing mysteriousness. SPACE.com caught up with Perlmutter at the 221st meeting of the American Astronomical Society in January in Long Beach, Calif., where the scientist shared his latest thinking on the murky entity he helped discover. So far the best explanation for dark energy is the cosmological constant. What is the cosmological constant? What in nature could be behind the cosmological constant? If it's a straight cosmological constant then we have at least one way to get it, that people know about, which is the zero-point energies of quantum mechanics. Because of all the particles and fields appearing and disappearing in empty space — that actually can have an energy associated with it, and that energy is actually an energy that can accelerate the universe. Tell me more about these particles popping into and out of existence. This is that very odd aspect of quantum mechanics, that the vacuum constantly has pairs of particles appearing and disappearing. It's bizarre from our intuitive point of view. We have no way of imaging why the vacuum is filled with this buzz of particles, at least it's counterintuitive to almost all of us who aren't working everyday with quantum mechanics experiments. And yet there's good evidence that these particles are there — we call them virtual particles. And there's lots of experiments you can do where you'll see the effects of these virtual particles. Why aren't scientists happy to accept the cosmological constant explanation? The problem there is that you need some physical explanation for why is it as small as it is, if that's the explanation. Because people originally thought that it would be gigantic, but happening to have two sectors that cancel each other perfectly. Now they would have to cancel each other almost perfectly and leave you with just enough to cause this acceleration. Sometimes there are no answers to questions like this. It could just turn out that that's the way the world was made. But I think I wouldn't give up yet [trying to explain why the cosmological constant is so small]. That's the kind of thing that we'd like to try to get to the bottom of and understand why it is. Of course it could be that the cosmological constant's not the best explanation, that there's some other field that has another natural scale that would explain it. Most of the astronomical observations we have now fit predictions based on a cosmological constant. Have any experiments so far seen an indication of anything other than a cosmological constant? No, and I think it will be really hard to, given how much tougher the next experiment is to do that. I think people are starting to feel like, 'Oh well, you haven't seen anything, so it's done,' but basically, we haven’t probed almost any of the new regions since the original discovery, so I didn't expect that we'd actually see anything different from the cosmological constant until the next generation of experiments has had a chance to begin. Will upcoming projects like the Dark Energy Survey (DES) or the Large Synoptic Survey Telescope (LSST) be able to discriminate between a cosmological constant and other explanations of dark energy? Well, it's a very tough job to do, and I think DES begins to step into the territory, and then LSST, WFIRST [Wide-Field Infrared Survey Telescope], and also MS-DESI [Mid-Scale Dark Energy Spectroscopic Instrument] — that is the one that probably has the first chance to do it. That's going to be coming in probably four or five years.